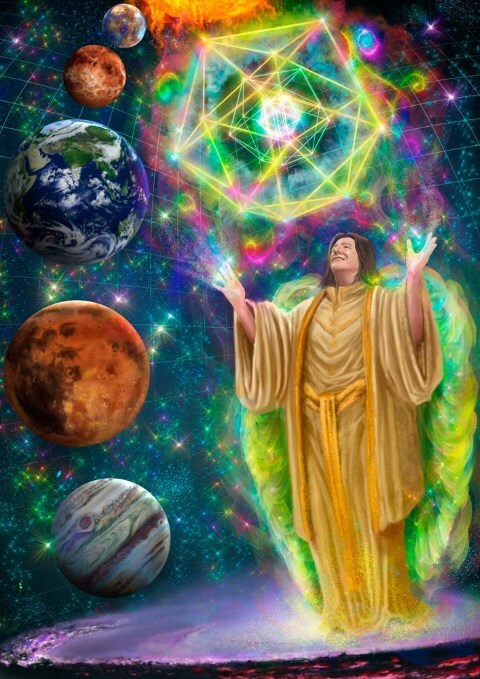 A general comprehensive programme downloaded from Archangel Metatron to bring about healing on many levels to any individual that is holding the crystal. The programme takes into account the general life experiences of individuals who are incarnated on Earth and the many situations they encounter that can create dis-ease and disharmony, causing emotional distress or illness of the mind or the physical body. 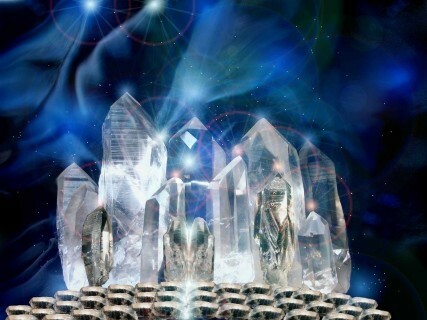 Anyone holding the crystal can benefit from its properties and the healing codes passed into it by Archangel Metatron. Because it is not programmed for one individual's needs, it can be passed to many friends and family to obtain healing. A lovely quality, clear, standing, faceted quartz crystal is used. In addition to its natural healing qualities, each crystal has been specially programmed by Archangel Metatron to hold the highest light vibrational healing codes to assist healing of our physical, mental, emotional and lower spiritual bodies. The crystal is held in the hand or placed within our auric field. It is not an item of jewellery. Payment can be made using PayPal (see ahead), Post Office Money Order, Western Union or cash. My drivers licence was due for renewal and as I have glaucoma in one eye, an optical assessment was needed for its renewal. So, I visited my regular optometrist for an eye test. Completing the test, he was concerned, saying I’d lost more sight in my eye and the cataract was growing bigger in the other eye. His conclusion meant certain conditions would now need to be attached to my drivers licence. He wrote a referral of the findings to my eye specialist for an appointment the following week. For seven days prior to my appointment with the eye specialist I decided to use the programmed healing crystal by Metatron. I rested it daily on my eyes and concentrated my own focus on the optic nerve and cataract. At the eye specialists, they were concerned reading the optometrist report. But when they tested my eyes and did an OCT scan, their results showed both eyes had barely changed since prior tests they had done. Consequently, they were able to fill in my Transport form allowing me an unconditional licence. The optometrist report was so different from the specialist findings, and in just days. The only thing I can contribute to this extreme difference, was using the healing crystal on my eyes. Thank you Metatron. Email Sandy at lightascension@optusnet.com.au to place your order. Please include your full name and your postal address and the method you are using for payment. AUSTRALIA: AUS $60.00 ($80 if using Paypal) includes tracking postage. Pay via Paypal link (ahead) or Cash, PO Money Order or Western Union (WU). f using Western Union - Worldwide on-line using Credit card or Bank account or pay at a local WU office. Make transfer choice payable in Australia to ‘Cash at Agent Location’. Include payment Tracking No. (MTCN) with your order. NOTE: Postal charge covers 2-4 items in same order to same address, so a 2nd item would cost only $52 for 2 crystals or $72 using Paypal.) If purchased with a Protection programmed crystal, also deduct $10 postage charge from Protection crystal amount..
UK/EUROPE/USA/ASIA/NZ/USA: AUSTRALIAN $90 ($110 if using Paypal) includes $30 postage with Tracking and Australian Bank charge. Please change money to Australian dollars prior to sending. Pay via Paypal link (details ahead) or Cash, PO Money Order or Western Union (WU). If using Western Union - Worldwide on-line using Credit card or Bank account or pay at a local WU office. Make transfer choice payable in Australia to ‘Cash at Agent Location’. Include payment Tracking No. (MTCN) with your order. NOTE: Postage charge covers 2-4 items in same order to the same address, so a 2nd item would cost only $60 (or $80 if using Paypal). If a Protection programmed crystal is purchased at the same time, deduct $10 postage charge from Protection crystal amount. You will need a Paypal Account to make a payment. NOTE about using this Paypal link. You can't delete the 0's already there. Just place your curser AFTER the last 0 (not at the beginning). Type in the amount and then the existing 0's are replaced from right to left, with the amount you type. Payment made in person in a branch of Western Union (offices found all over the world. Google WU for an office in your town). You will need ID to send money. In the agency, please change your currency into Australian dollar currency and pay the WU transfer fee before sending money. Recipient is - Sandy Stevenson. PO Box 1080, Palm Beach 4221. No need to add this address if they don’t require it. 1. Where it says on the form - How does receiver want money’- tick 'Cash' box. 3. Fill in amount. Country/State = ‘Australia/Queensland’. Payable to ‘Sandy Stevenson’. 4. Tick boxes - ‘Cash Pick Up’ and ‘Next Day. 5. In the USA - the form offers a ‘Test question’ for the recipient of money to answer - but a question is NOT required in Australia. Please include payment Tracking No. (MTCN) they give you when you post your order. ♥ He is charged with sustaining human life and acts as the Bridge between the Divine and mankind! ♥ It was Metatron who stopped Abraham from sacrificing his son Isaac to God. ♥ Had a human incarnation as the prophet Enoch and the 7th Patriarch after Adam. During is lifetime he was a great ruler of his people, governing with justice and peace. He is accredited with bringing writing and books to humanity and is supposed to have written 366 books during his lifetime, including books on the Sacred Knowledge of Creation - creation stories based upon patterns of sacred geometry. He is also supposed to have taught the 'Sons of God' how to construct cities and brought through knowledge of the Zodiac and planets. Much of the time he lived a pious life in seclusion when not teaching. He was given the position of Heavenly scribe and asked to maintain the eternal archives of God, recording every event that occurs. Having moved on from that position, he now oversees the Akashic records of each individual, keeping their karmic records. He oversees all the other recording angels. With this position he sits along side the throne of the Lord and to enter into the seventh Heaven, one passes by him first. He is the governor of the 'Stellar Gateway' chakra situated about 3 feet above the top of the head, which begins to open as we develop spiritually. Find a quiet time and place. Sit down and hold the crystal comfortably in your left hand for at least 10 minutes. You can do this as often as you like but not more than several times a day in the first 3 weeks. Then once daily is fine. Healing can also take place at night while you are sleeping. The crystal needs to be within your energy field to work, so you could place it safely on a bedside table close to your bed. You can leave it under a pillow but this could result in a breakage or it being forgotten. Quartz crystals absorb negative energy from your space, so to keep the crystal functioning its needs regular cleaning. Clean the crystal weekly by placing it for a few hours in a glass bowl of ocean water or you can use spring water with good quality salt.